Given the increasing importance of mobile phones in people’s lives, businesses are impinging on this idea and moving on to develop mobile applications that will help them boost their marketing and improve sales. So if you are looking to do the same, ORS Infotech is here to help you out. In order to develop mobile apps, there are many things that one needs to familiarize themselves with. Luckily for you, our team of developers, at ORS Infotech, are well-versed in all these technicalities and know how to develop apps that will be attractive while at the same time being easily accessible. The language used to develop iPhone apps is based on C language. Though working with this may be difficult for most app developers, our skilled team has the expertise to tackle the task. When developing an application, developers have a lot to think about. 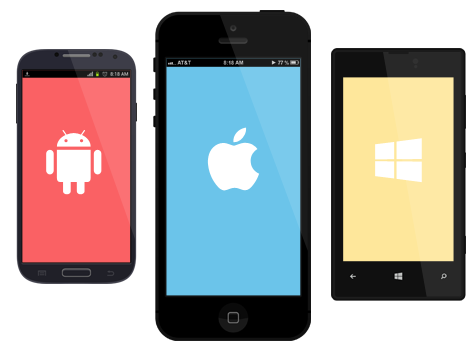 Preparing an application that works on different platforms is usually more effective because if an application works on just one mobile platform when there are perhaps 3 or 4 platforms will make it ineffective. Therefore, ensuring the application can run on many platforms is what a good app developer will always try to achieve. And our mobile application developers are conversant with these nuances and have the technical proficiency to create an iPhone app that runs on multiple platforms. Why Our iPhone Applications are Highly Sought-After? Since Apple is considered a pioneer of wise designs, many companies are beginning to turn to the use of an iOS platform. iPhone apps have shown amazing productiveness gains and this is why businesses are beginning to use it. Most iPhones, though simplistic, are quite comprehensive and provide a lot of options for users. This is why Apple is continuously upgrading the iPhone, making it a more efficient mobile business device. Managing sales : By tracking leads and opportunities for business or recording meetings and follow-ups, your business will certainly benefit from our iPhone apps. Integrating Information : The iPhone works in a way that allows easy integration of all information stored within it. We can help your business integrate various devices with the application thereby making management easier. Facilitates Business : Our iPhone mobile app is capable of providing information quickly, thereby allowing you to make quick decisions which is sometimes the thin line that divides failure from success. By making use of the framework of iPhone applications, we will develop efficient applications that will serve the purpose needed. Having already developed a number of iPhone apps in various categories, there is certainly nothing that our developers can’t do for you. With ORS Infotech, you can turn your business ideas into a reality with our iPhone applications that are designed to cater to all your requirements.